Corona B Gone won the $41,400 Bank of America Emerald Downs Championship on Sunday. Corona B Gone ($37.20) and jockey Lorenzo Lopez overcame a bumped break that plagued most of the field, finding themselves in second early and continuing on to a three-quarter length lead over Kool Odds. The winning duo posted a time of 22.329 for the 440-yard event and earned a 90 speed index. Corona B Gone is trained by Hector Magallanes for owner Ruben Magallanes. Michael and Shannon McKay bred the 3-year-old gelding in Oregon, by Favorite Cartel and out of Go Girl Gone, by Shazoom. This was Corona B Gone’s first attempt and win in a 440-yard event and his first career stakes win. He now has five wins from 14 starts and has earned $46,774. Corona B Gone’s past performances include several futurity and derby appearances and a recent third-place finish in the Sun Downs Derby Challenge in May. Kool Odds and Nikeela Black finished in second place by a half-length at odds of 15-1. The 3-year-old colt is now multiple stakes placed and qualified for the $104,000 Bitterroot Futurity last year at Sandy Downs. He has won three races and has placed in the money in seven of his nine lifetime starts. Mark Hanson trains Kool Odds for RTM Stables, LLC. He was bred by Steve Burns, DVM in California, by Favorite Cartel and out of the Chicks Beduino mare Kool Kue Chick. Rounding out the Favorite Cartel trifecta was Favorite Bling and jockey Jonathan Roman by a head. 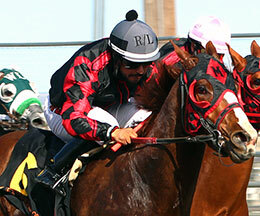 Favorite Bling is a 3-year-old filly trained by Jose Rosales Gomez for owner Juan Morales. She was bred in Oregon by Don and Peggy Boyle, out of Spring Bling by Hawkinson. Favorite Bling had won her last two starts, including the Sun Downs Derby Challenge in which Corona B Gone finished third. She has won three of her 13 lifetime starts, two of which have come since she has moved north to the Pacific Northwest after competing in claiming events at Los Alamitos. Completing the field were Poutn On the Wagon, Mr Pyc to You, L Bar D Genuine Red, L Bar D Bonnie Lee, Tickle Ur Fancy, Mals First Down and For Sweet Jess.